Attack of troops from the three divisions of the Waffen SS Totenkopf, supported by a Panhard 178 armored captured on Bethune on May 24, 1940. On the morning of 19 May, SS-Gruppenführer Theodor Eicke received the division’s orders. He was told to prepare for enemy counterattacks from the north and, shortly afterwards, ordered by 15th Panzer Corps to move into France towards the village of Le Cateaux, where Rommel’s 7th Panzer Division was in serious difficulty in the face of a heavy French attack. Eicke sent Totenkopf’s 1st Infantry Regiment, commanded by Standartenführer Max Simon, with anti-tank engineer and artillery companies to relieve the pressure on Rommel. Thus, as Simon’s regiment crossed the Sambre River and pushed towards Le Cateaux and Cambrai, they became the first Totenkopf troops to enter combat in a series of vicious house-to-house battles with French Moroccan troops in several small villages in their path. Once the Moroccans were dislodged, the French counterattacked with tanks, but the first infantry regiment held firm. By mid-morning of 20 May, Totenkopf had cleared the areas to the north and east of Cambrai and taken 16,000 prisoners and a large haul of weapons and supplies, thus allowing Hoth’s 15th Panzer Corps to resume its advance. Totenkopf had also taken its first wartime combat casualties, with 16 dead and 53 wounded, while claiming that they had killed some 200 Moroccan soldiers. It is testament to the ferocity of Totenkopf’s first day’s fighting and quite possibly indicative of the racial attitudes of its troops that only 100 prisoners were Moroccan. As the division paused briefly, Eicke’s supply column remained stuck in traffic in Belgium, so Totenkopf had to draw its rations from Rommel’s 7th Panzer Division’s stores. While Totenkopf was entangled around Cambrai and Artois, and elements of the 7th Panzer Division reached Arras, the first German troops of the 2nd Panzer Division reached the English Channel. Here they cut off 40 French, British and Belgium divisions – nearly one million men – from the bulk of the French Army to the south. However, the Germans only occupied a thin 50-65-km (30-40-mile) wide strip. When the advance resumed, Eicke was ordered to join General Rudolf Schmidt’s 39th Corps and advance westwards between the 8th Panzer Division to Totenkopf’s south and the 7th Panzer Division to the north. The intention of Army High Command was to ensure that the cut-off Allied forces in the north did not re- establish contact with the French forces to the south. Totenkopf was part of the forces that would plug the gaps left by the rapidity of the German advance. In fact, the British and French were indeed intending to cut through the extended German line and restore a common front. The only real hope that the Allies had was to launch an effective blow against the flank and rear of the German spearhead. Lord Gort, the commander of the British Expeditionary Force (BEF), began to organise a thrust southwards, exactly what the German commanders feared most. Given the horrendously disrupted state of Allied communications, this was not an easy task. Gort and Major General Harold Franklyn, from whose 5th Division the attacking force was drawn, assembled a mixture of disparate Anglo- French forces, a tank brigade, two territorial infantry battalions, some garrison troops and field artillery. A much-depleted French light mechanised division would support the attack from the west. The two French infantry divisions Gort was promised to support his eastern flank failed to materialise. Franklyn gave command of the attack to Major-General G. le Q. Martel, one of Britain’s interwar tank pioneers. Martel had merely 58 Mark I and 16 Mark II `Matilda’ infantry tanks. The tanks were heavy, slow and cumbersome, and the Mark I was armed only with machine guns and the Mark II with a 2-pounder gun. This was of a similar calibre to the standard 37-mm German gun, but with considerably more hitting power. The French division could muster about 60 Somua tanks. Given the poor state of Allied intelligence and having been ordered to proceed without reconnaissance, Martel had no idea what German units faced him as he started to move south in two columns west of Arras at 1430 hours on 21 May 1940. In fact, he was about to come up against Totenkopf. By coincidence, the Germans had decided to move northwards and 7th Panzer, with Totenkopf to its west, rolled northwards directly into the path of Martel’s counterattack. Very fortunately for Totenkopf, the brunt of the British attack in their area smashed right into the division’s tank destroyer battalion. The battalion deployed quickly, but soon found that the unit’s 37-mm Pak 35/36 anti-tank guns were utterly ineffective against the British Matildas’ 60-mm armour. Rommel’s 7th Panzer Division was having similar problems; one Matilda was discovered to have been hit 14 times by 37-mm shells before it was finally disabled. The British tanks rolled over two of Totenkopf’s anti-tank companies, causing considerable casualties; the third company suffered particularly heavily. Those who stayed by their guns were killed at close range or even crushed by the 30-ton British tanks. Horrified by the ineffectiveness of their weapons, several companies fell backwards and at least one supply column left their vehicles and fled on the approach of British tanks. However, along with Totenkopf’s 3rd Infantry Regiment’s heavy machine guns and mortars, they counterattacked again using grenades. They were repulsed with further heavy casualties. Eicke resorted to having the division’s artillery fire on the British tanks over open sights before the arrival of Stuka Ju 87 dive-bombers finally blunted the assault. Meanwhile, Rommel’s division was hit by the main weight of Martel’s attack and, according to Rommel’s own account, verged on collapse and rout. Rommel drove from unit to unit, quickly organising a defence in depth and counterattacks, and used every available gun, artillery piece and Luftwaffe 88-mm anti-aircraft gun firing – similarly to Eicke’s guns – over open sights, thus halting the British advance. This account of Totenkopf’s role in stalling the British tanks varies with most versions of the battle. The emphasis has largely been on the rout of Totenkopf’s anti-tank companies and the embarrassment this caused the division. Much of this relies on Rommel’s description of the battle, which heavily emphasised his own role in retrieving the situation. Even Heinz Guderian reckoned that the division `showed signs of panic’. Yet the panic in Rommel’s division was worse than that in Totenkopf and while obviously Rommel was instrumental in the battle – his division faced the bulk of the British attack – Totenkopf appears to have performed more creditably than is usually recognised. Whatever the case, Totenkopf had sustained its worst casualties in its heaviest day’s fighting so far. There were 39 dead, 66 wounded and two missing, mostly from the tank-destroyer battalion. The 7th Panzer Division fared considerably worse and the Germans lost some 20 tanks and a similar number of anti-tank guns. The British assault – although poorly organised and executed, launched without air cover or proper reconnaissance and utterly unsupported – had given the Germans a real shock and the German advance paused temporarily. While Eicke’s men rested, the SS general received fresh orders transferring the division to Erich Hoepner’s 16th Panzer Corps, which already contained the 3rd and 4th Panzer Divisions and the SS-Verfügungs Division. Hoepner’s corps was detailed with spearheading the attack on the British and French forces isolated in northern France and Belgium. 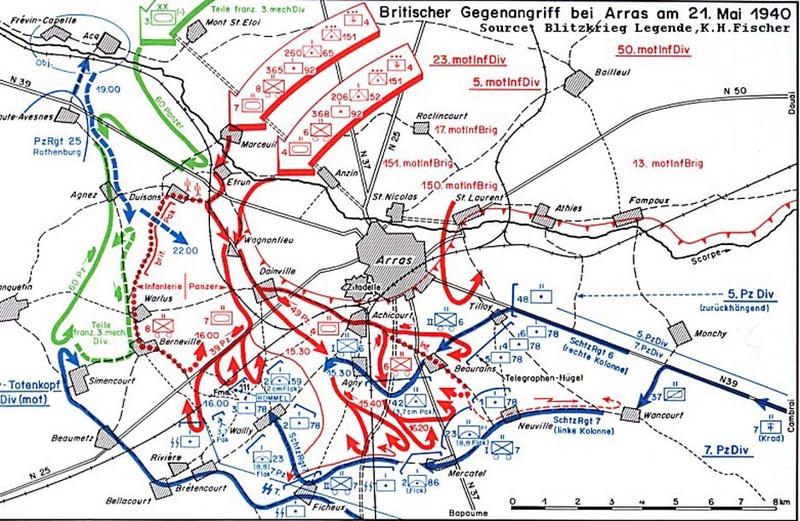 Hoepner ordered Eicke to proceed northwards with caution, given what had happened at Arras. There was light contact on 22 May as Totenkopf resumed its advance, but this was easily brushed aside. Hoepner ordered the division to move towards the town of Bethune, which lay astride La Bassée Canal, a natural defensive position that the British had retired behind. Eicke was then to reconnoitre the area and find a suitable crossing point. He promptly disobeyed these orders and entered the town with the intention of crossing the canal. His men were forced to withdraw when they found the British strongly dug in in the town. As Eicke began to search for a crossing point, the British rapidly began to reinforce their positions on the opposite side of the canal. On the morning of 24 May, elements of the 3rd Infantry Regiment led personally by Eicke forced a crossing lower down the canal and established a bridgehead. Just at this point, the division was ordered to break off the attack and withdraw back across the canal. This was due to Hitler’s controversial halt order of 24 May, which held Army Group A’s armour along the canal line and stopped all ground attacks. The purpose of this halt order was probably to preserve the tanks for the forthcoming battles in central France and allow the Luftwaffe the opportunity to attack the Allied troops in the pocket that had formed around the port of Dunkirk. Eicke was furious given the losses he had taken first in crossing the canal and then while withdrawing. Hoepner was equally angry when he found out that Eicke had disobeyed his orders, accusing the Totenkopf commander of caring nothing for the lives of his men and allegedly calling Eicke `a butcher’ in front of his staff. 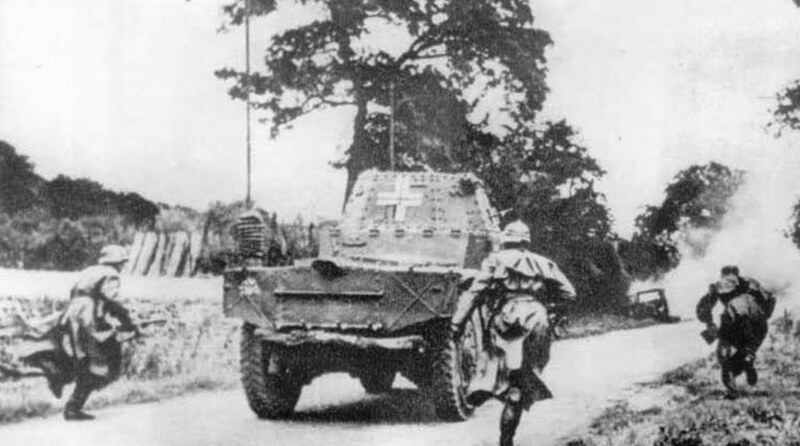 Interesting to see the picture of the Totenkopf using captured Panhard armoured car – did they suffer losses to their own armoured cars which required the immediate use of captured French equipment, or was the Panhard superior to the German armoured cars?